In passing along the street the other day we noticed a female turn out of her way in passing the Provost Marshal’s office to avoid walking under the American Flag which is displayed across the side walk. 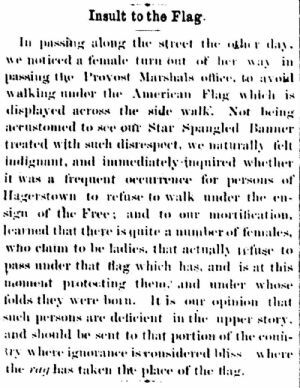 Not being accustomed to see our Star Spangled Banner treated with such disrespect, we naturally felt indignant, and immediately inquired whether it was a frequent occurrence for persons of Hagerstown to refuse to walk under the ensign of the Free; and to our mortification, learned that there is quite a number of females, who claim to be ladies, that actually refuse to pass under that flag which has, and is at this moment protecting them, and under whose folds they were born. It is our opinion that such persons are deficient in the upper story, and should be sent to that portion of the country where ignorance is considered bliss where the rag has taken the place of the flag.